Greetings friends, and happy Friday ;) I hope you have had a fun-filled week and enjoyed a reprieve from the heat. It has been more pleasant here lately, though I here were in for 99 degree temps today. Ugh! Obviously, I am not attending Blogher this year. Perhaps I'll make it there one day. My question for today is simply: If you were to attend Blogher, who would you want to meet? Thanks for stopping by! 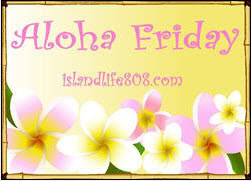 I love hearing from you ;) Be sure to visit An Island Life for more Aloha Friday fun. you and a nut in a nutshell, lol. So, two nuts. ha ha ha! ONly kidding.